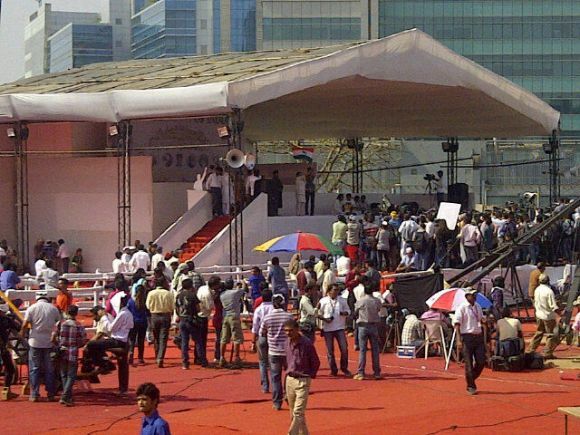 Team Anna has firmly laid claim to the stage set inside the MMRDA grounds in Bandra-Kurla Complex. However, post noon barely 10-15 per cent of the ground had been occupied by the supporters. IAC volunteers are confident that the crowds will grow as the day and protest progresses, reports Toral Varia Deshpande. Anna Hazare, flanked by Kiran Bedi, Arvind Kejriwal, Mayank Gandhi and others arrived at a relatively-disappointing crowd at Mumbai's MMRDA grounds half past noon. The stage was set and security arrangements were in order. However, the number of supporters at the MMRDA grounds was not what one would call exactly 'encouraging'. There was clearly an attempt on the part of Team Anna to garner crowds. Kiran Bedi attempted to create a two-part story on why and how she got involved with the agitation. She tried to seek more support by addressing the crowds. "I will tell u the first part today, for the second part you will have to come tomorrow. You will come na? U will leave your homes and offices to come here and show your support?" Clearly aware of the not-as-expected turnout, Bedi offered her thanks to those who have expressed support. She said, "I extend my thanks to those who were standing on both sides of the road and waving to Anna as he was passing. Even if they haven't come here on the grounds, they have still expressed their support. I also thank those who are at home and watching this protest. At least they are watching and connecting with us. They are keeping track of this movement." Medha Patkar, another staunch supporter of this movement, said, "This is not a game of numbers. It is a working day; people may have gone to work. But we know that they are with us." 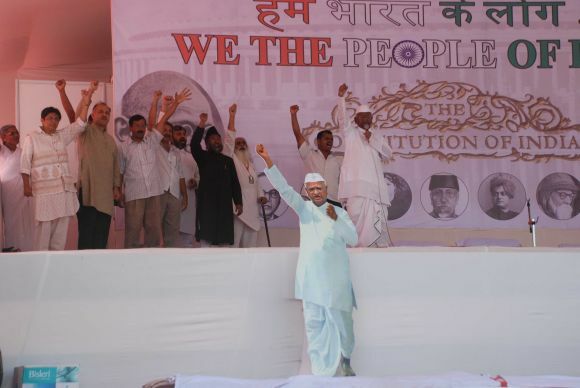 Meanwhile, Hazare, who is suffering from a bout of viral fever, is expected to address the gathering later in the day. Bedi did appeal to Hazare to give up his fast and consume some fruits or food, but the latter continued with the protest. 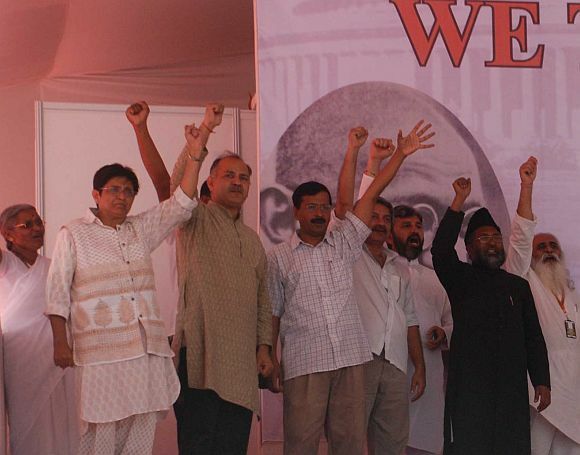 Team Anna member Arvind Kejriwal too echoed Bedi's sentiments. He said, "Annaji is on antibiotics. He has been unwell since the last three days. We had requested him earlier too, to rest and to stay at home. We have told him that we will carry forward the movement. But Anna is firm on this protest. But, now that you -- the people of India -- have requested him, I am sure he will consider your request to rest." 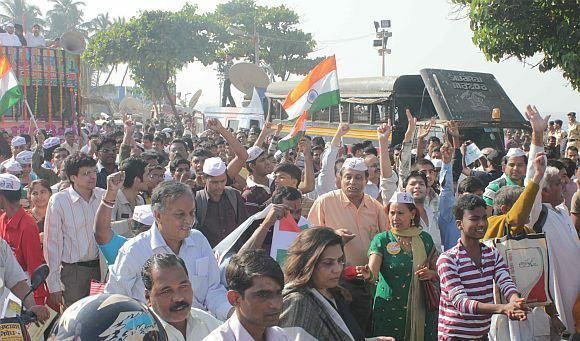 IAC volunteers could be seen distributing water those who had turned up in support. They are confident that the support will increase as the protest progresses.